31 Jan Filed under Kiddos, Sister Brittany Winter. Time for tea! 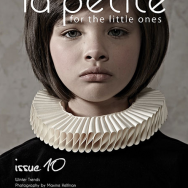 Brittany Winter styled this somber kid’s tea party for the new issue of La Petite Magazine. We love the minimal set design and overall dreamy tone of this shoot. It’s like a dark fairy tale. Photography by Maxine Helfman.